Meadowbrook takes nutrition seriously. 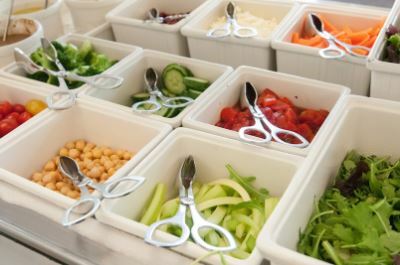 School tuition includes daily snack and lunch for every student. Our cafeteria is bright, warm and spacious, and lunch is served “family style” in two seatings, one for grades senior kindergarten through 5th grade, and one for middle school students. Family style means students participate in every step of the meal. Every child at the table has a role - whether that’s serving the main entree, scraping plates, clearing silverware, or being a “buddy” to the SK’ers and helping them around the dining room. Lunch is special part of the day where students relax and recharge. All of our food is provided by Flik Dining Services. Whole grains and balanced nutrition are emphasized, and many items are made in-house to ensure quality and reduce issues related to food allergies.